Thinking about learning to knit last week got me thinking about great beginner projects. 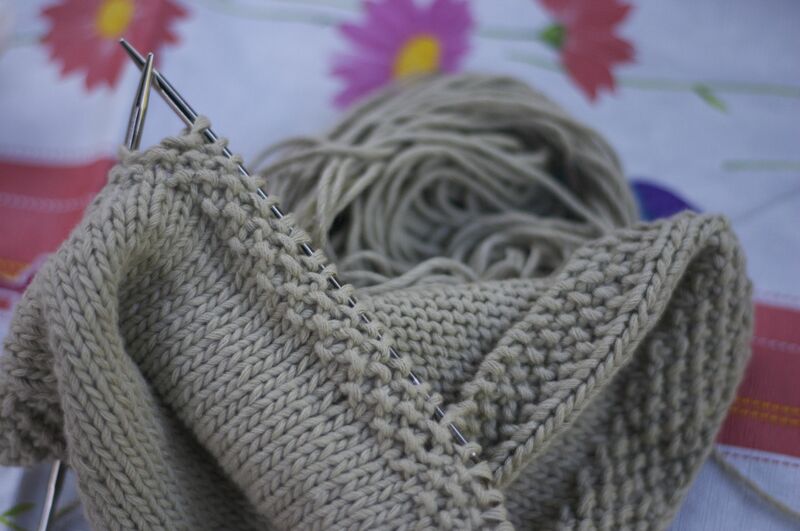 What to do with a beginner is obviously quite dependant on the individual but I think there is one project that is really great for anyone learning to knit. It’s an oldy but a goody, both useful and sometimes beautiful: the dishcloth. A lot of people make dishclothes. This may horrify some knitters I’m sure. Wipe dirty dishes with my long slaved hard work!? Perish the thought. I myself, however, am more of a process knitter and since I so enjoy knitting, I really care a lot less about the finished product than I probably should. So, dishclothes work just fine for me. Why knit a dish cloth at all? Well, I think there is something to be said in defence of a useful knit. If you are thinking to yourself that you can just BUY dishclothes for reasonable little money, let me stop you right there. You can buy anything you knit. They sell socks, sweaters, blankets, toys, skirts, blouses, shawls, anything you can knit is sold in many locations near you. That is certainly no reason to not knit something! I happen to think knitting creates a very nice fabric for a dishcloth as well. They really excel at wiping down counters especially. Now, why are dishclothes perfect for beginners? Because you can do absolutely anything in a dishcloth. Swatches of different stitches make excellent learning tools and why let them go to waste? They can easily become useful and pretty dishclothes. Dishclothes also make a nice gift if you feel the need to make many in order to perfect a newly learned skill. So, with that in mind I have a few pattern and yarn recommendations. 1. Wedding Dishclothes from the PurlBee. These little babies are simple and nice and they are done in Blue Sky Skinny Cotton. I’ve made several of these myself and they wear VERY well. It’s a yarn with a hearty spin and they have lasted what feels like a million washes. I’ve also made them for friends and they have gone over quite well. I like that I know this not because they told me they like them, but because I’ve seem them in action. It’s a good feeling. To make these you will need the pattern here and a skein or two of Blue Sky Skinny Cotton. 2. The Mitered Dish Towel is a charming way to use my 2 favorite things: bright yarn and fun buttons! Also an absolutely wonderful gift these towels can teach a beginner all about increases and decreases and I think they have the right level of interest for a beginner. To make these you will need some 18 stitch gauge cotton (come on in and we can certainly help you pick some out) and the pattern is a freebee here. 3. If you are looking for something a little more challenging you can try this trio of dishclothes. They are each a different stitch so when you are ready to experiment a little and branch out it’s a good new project. To make them you will need a few skeins of Blue Sky Alpaca Dyed Cotton and the free pattern from Ravelry here. This entry was posted on Monday, August 2nd, 2010 at 11:47 am	and is filed under Uncategorized. You can follow any responses to this entry through the RSS 2.0 feed. Both comments and pings are currently closed.